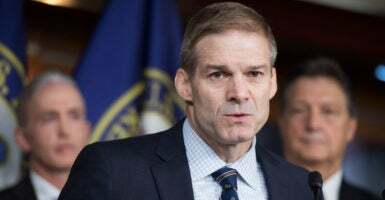 Rep. Jim Jordan warned against infringing upon Americans’ Second Amendment rights to pass more gun controls and said most bad people will find a way around the law if they’re determined to do something evil. I always say bad people aren’t—they’re bad people. They’re going to get around the law and do something bad if they’re bent on doing that. We’ve got to be real careful about restricting fundamental liberties. Where we can do it consistent with the Bill of Rights and Constitution, then I think we have to be open to that. But we’ve got to be careful about that. I always say the Second Amendment is next to the first because it’s pretty darned important. The Founders understood that. … Remember, this guy broke the law. He obviously brought a gun to a gun-free zone. There are already laws on the books that say that you should not be bringing firearms to this location. Obviously, that was the case and he violated the law. What other laws are we going to put in place to stop this? I don’t know that you can. Bad people figure out ways to do bad things. They don’t adhere to the rule of law as evidenced by what the terrible deeds that this individual did. I’m always nervous about putting restrictions on law-abiding citizens’ fundamental liberties, when we have these terrible situations take place.